Lara Giddings apologising to people affected by past forced adoption practices, 2012, courtesy of Office of the Premier of Tasmania. 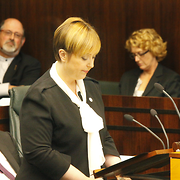 The Apology to People Hurt by Past Forced Adoption Practices was moved in the Tasmanian House of Assembly on Thursday, 18 October 2012 by the Labor Premier, Lara Giddings. 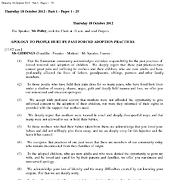 The 2012 report on the Senate Community Affairs Reference Committee's Commonwealth Contribution to Former Forced Adoption Policies and Practices prompted the Apology. A number of other members of the House, including the Leaders of the Liberal Opposition and the Greens, supported the move. We acknowledge the lifelong damage that has been done to the lives of those affected by past forced adoption practices, and we commit to ensuring that these unethical, immoral and illegal practices are never repeated. We come together today in this House, the three political parties united, to acknowledge the deep hurt caused by past forced adoption practices. We are here as representatives of the Tasmanian community to offer our sincere apology to mothers, fathers, their children who are now grown up, and their families. We come together to take responsibility for those practices which were wrong, not merely by today's values but also by the laws of the time. Giddings acknowledged that not everyone had been damaged by adoption. Her speech included some of the history of adoption and forced adoption in Tasmania. She detailed the injustices experienced by mothers, fathers, and children.